The Dream Big Podcast is a family-friendly podcast inspiring kids (and adults!) to pursue their passions in life and take action to make their dreams a reality. 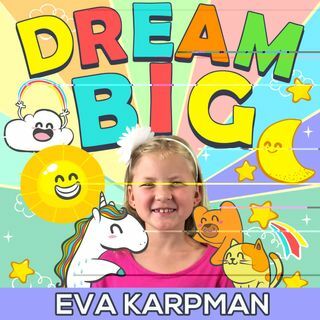 Your hosts Eva Karpman (currently 9-years-old in the 4th grade) and mom Olga Karpman interview world-class performers who do what they love and live their dreams each and every day. Eva also does solo episode where she answers questions from our audience and discusses personal development principles. The Dream Big Podcast’s short ... Maggiori informazioni 15-20 minute format makes for the perfect length to listen to an episode in the car with your kids. Subscribe and together we can inspire each other to dream big and take action. To get to the podcast website, cut and paste the link DreamBigPodcast.com into your browser. Get ready to DREAM BIG!